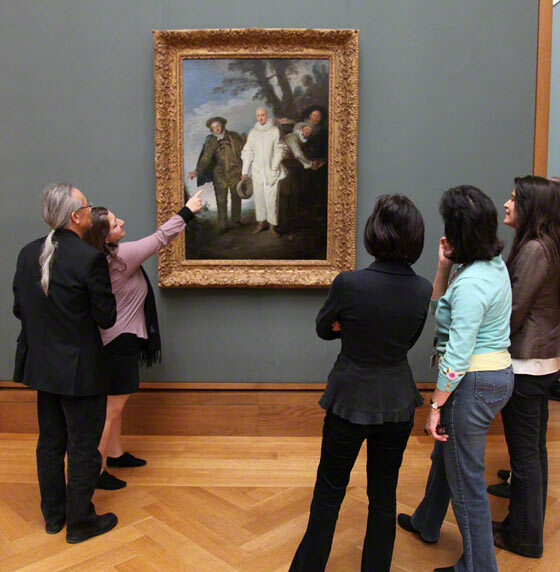 A first look: Gallery teachers study Watteau’s newly installed The Italian Comedians in preparation for introducing visitors to the painting on gallery tours. The Getty Museum’s most recent painting acquisition, Jean-Antoine Watteau’s The Italian Comedians, is now on view at the Getty Center. 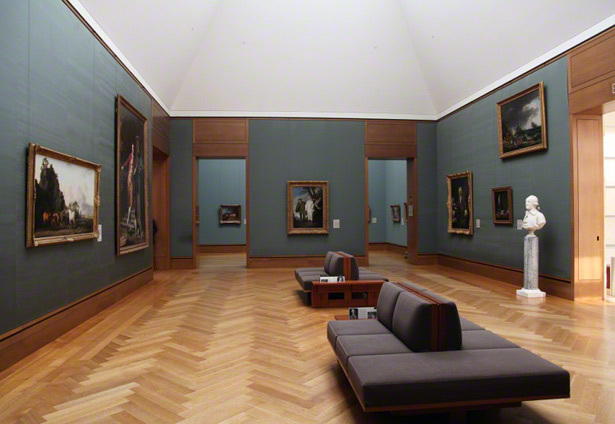 It’s installed in Gallery S202 with an array of other 18th-century paintings in the collection, including one by Nicolas Lancret. 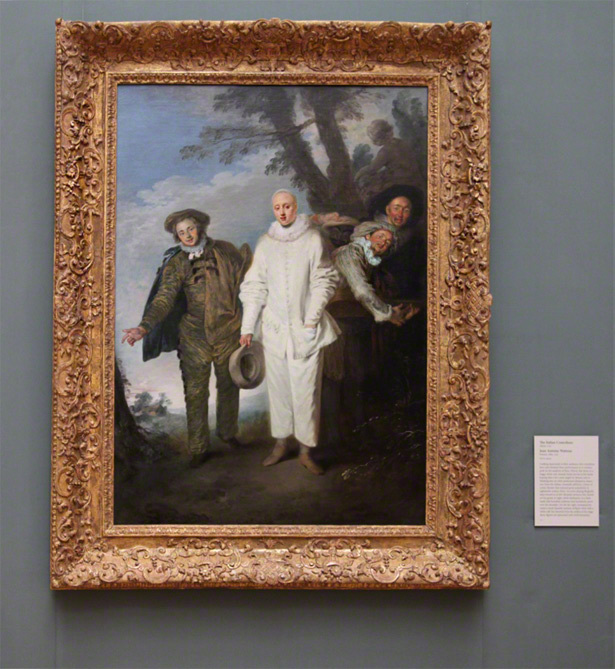 Watteau and Lancret were both known for the fête galante, a popular genre of French painting that depicted the outdoor leisure activities of the rich—picnicking, dancing, taking in performances. Watteau popularized this theme, and it may have been his fame as a painter of fêtes galantes that inspired Lancret to join the workshop of Watteau’s teacher Claude Gillot. 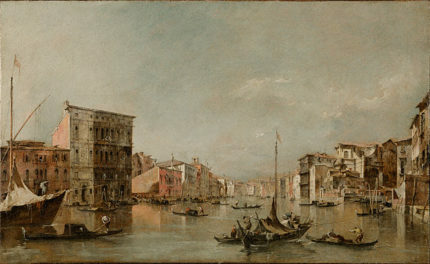 Lancret probably met Watteau himself around 1712. 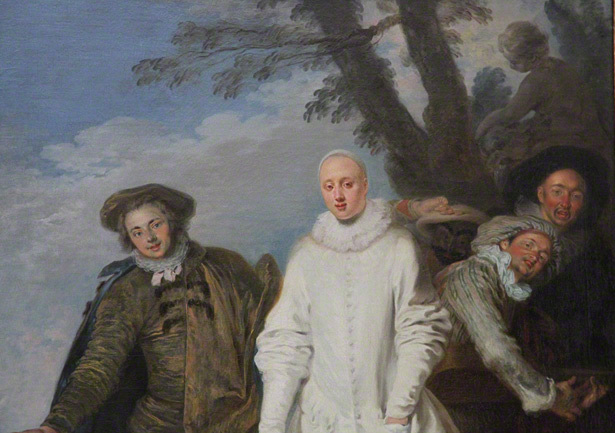 After Watteau’s early death at the age of 36, Lancret became France’s leading painter of the genre. 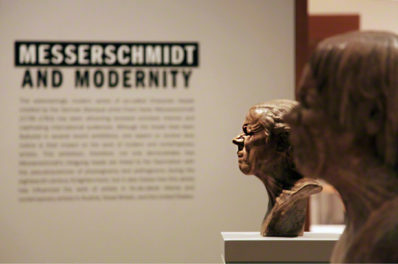 These two artists, students of the same master, are now represented by two paintings hanging across from one another in the same gallery. Watteau’s The Italian Comedians and Lancret’s Dance Before a Fountain from about ten years later show two very different views of a day at the park for France’s upper crust. 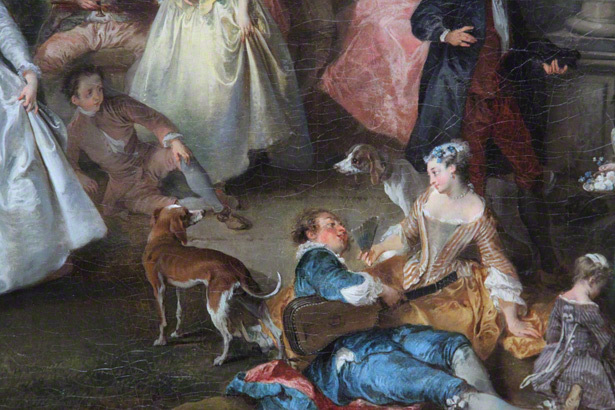 Lancret paints the well-to-do audience at their leisure, dancing by a fountain, cooing in couples, and generally enjoying an amorous day in the park. Even the dogs appear to be in love. 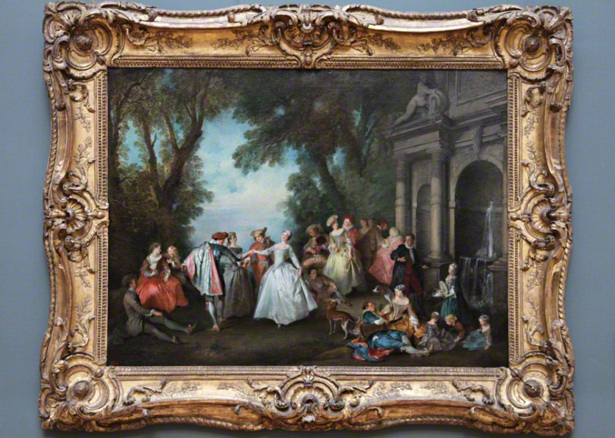 Watteau presents a compassionately rendered troupe of actors who have just finished performing in the park for an upper-class audience like Lancret’s. 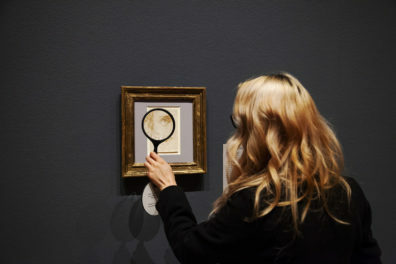 The central figure, an actor dressed as the popular character Pierrot, reaches into his pocket, urging the ladies and gents in Lancret’s scene to reach into their pockets and make a donation. Please, mesdames et messieurs, a donation for the performers? 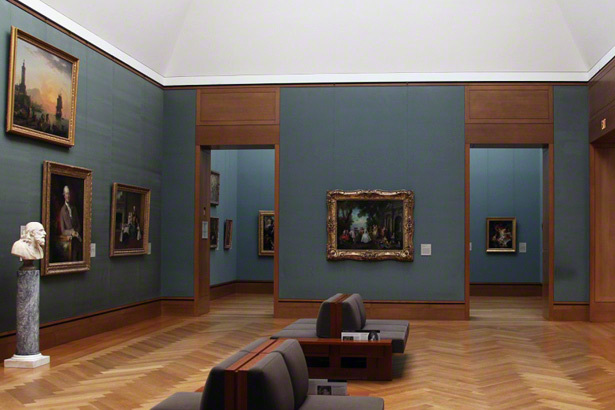 Watteau’s Italian Comedians anchors one wall of Gallery 202 of the Getty Center’s South Pavilion. Lancret’s Dance Before a Fountain faces the Watteau across the long gallery.